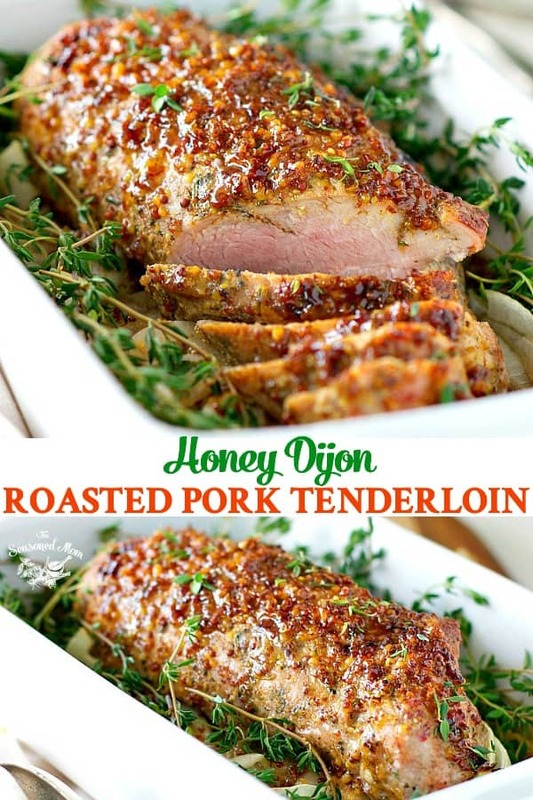 Juicy and delicious Honey Dijon Roasted Pork Tenderloin. This roast is super simple, healthy and a sure family favorite! 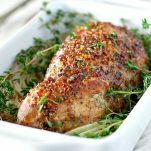 You only need 5 ingredients and about 5 minutes to prepare this tender, juicy, and healthy Honey Dijon Roasted Pork Tenderloin! 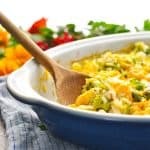 It might look like a fancy holiday meal, but this clean eating dinner is about to become your go-to weeknight special! Pork is so underrated, isn’t it? It often gets overlooked in favor of “the other white meat,” but I swear…every time I serve pork, Keith and the boys devour it! 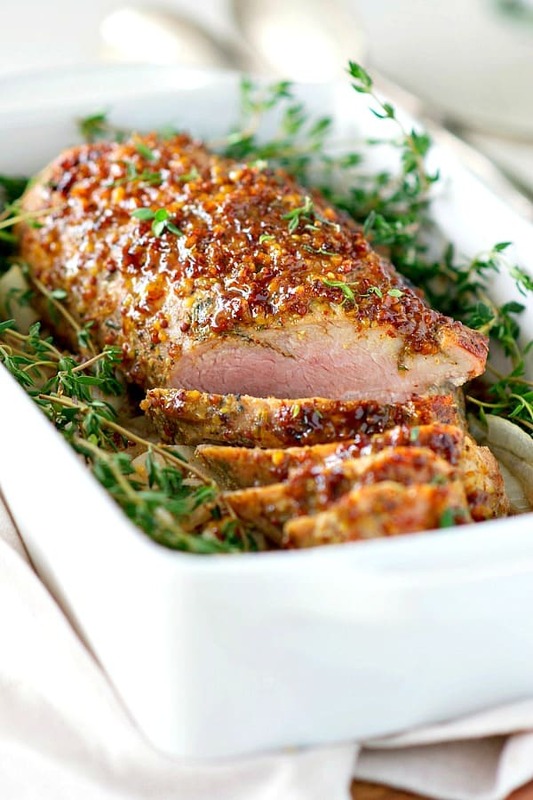 This simple roasted pork tenderloin was no exception! Note to self: BUY MORE PORK! ? I’ve tasted my fair share of dried out pork tenderloin over the years, but if it’s cooked right it doesn’t have to be bland, boring, and chewy! 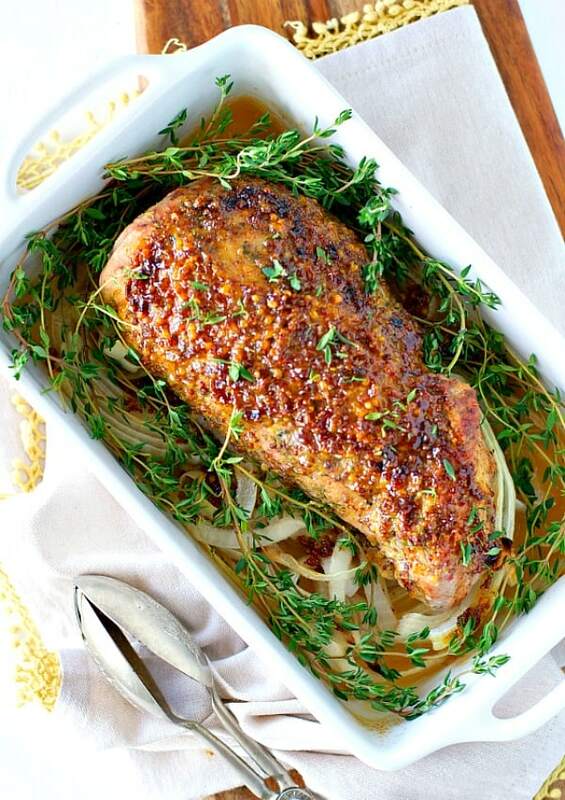 And something about the combination of sweet honey with the tangy mustard and fresh herbs and onions just gives this piece of meat so much delicious flavor. Plus, you gotta love the crust that forms on the outside…LOOK at that! As usual, my favorite part about this whole darn recipe is the fact that it’s EASY. And that it only requires a few pantry ingredients and a few minutes of my already-short time. Can you relate?! 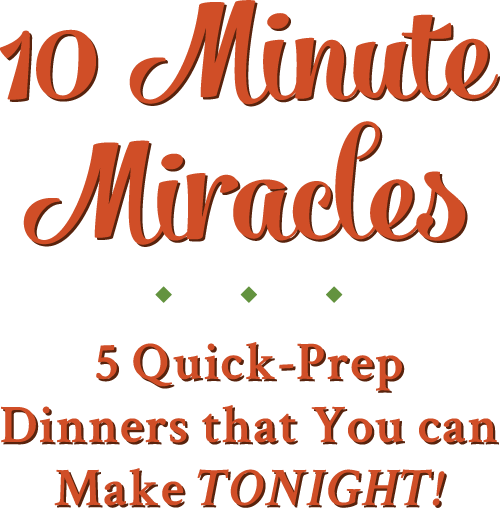 Your family will love this healthy dinner option! Pork tenderloin: I used 1 lb to serve 4 people. Make sure to buy good quality meat for best results. How Can I Tell That The Pork Is Cooked? The pork should have an internal temperature of 140-150 degrees F. I like to use a meat thermometer to check it’s cooked through. It’s especially handy when cooking large roasted like this. At this temperature, the pork will be blushing pink, tender, juicy and delicious, just as it should be! In a small bowl, stir together mustard, honey, and thyme. Remove cover, brush with remaining mustard sauce, and put under the broiler. Remove from oven and allow pork to rest before slicing and serving. 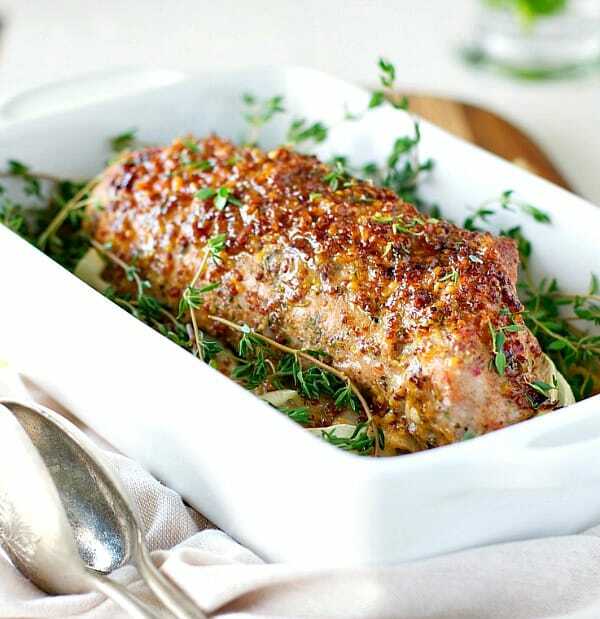 To keep things light you could serve this pork tenderloin in slices with salad. It’s also a great way to eat it cold if you have leftovers. Other favorite sides of mine are roasted potatoes, grilled veggies, and even beans. This pork is so versatile you can serve it with whatever you like! This pork looks amazing, Blair! Your pictures are just gorgeous. I want to reach right through my screen and taste this! 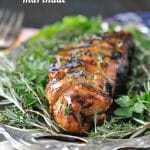 I always struggle with new ideas for pork tenderloin, so I’m loving this five ingredient dish. Pinned! Thank you, Gayle! I know…I always struggle with new pork ideas, too. This is a great one to try! 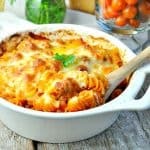 Another pinning recipe! I LOVE how simple this is. We’ve started to eat more pork lately. It’s cheap, and prepared right, SO delicious. That crust – swooning over here!!! Yay! That’s great, Kristine! I’m so glad that you tried it, and I’m even happier that you enjoyed it. Thanks SO much for letting me know!!! MY PROBLEM IS THAT MY PORK ALWAYS TURNS OUT DRY. WHY IS THIS? Hey, Renee! I would imagine that maybe it cooks too long? Not sure! I made your recipe last night. My husband and I love mustard so I was attracted to your recipe. I loved the onions underneath the pork. Your picture is prettier than mine but it tasted very good. We don’t have fresh thyme growing in Michigan quite yet so I used dried. I will make again when I have my herbs growing this summer. This is an easy recipe too. 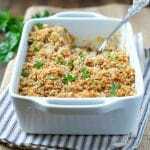 I served with pureed cauliflower and green beans. Thanks for the recipe! Excellent! Thanks so much, Raymund! Why pictures are always different from the receipt? Your picture shows thyme branches and the receipt says ‘minced thyme leaves’. What’s the right way of preparing the receipt? 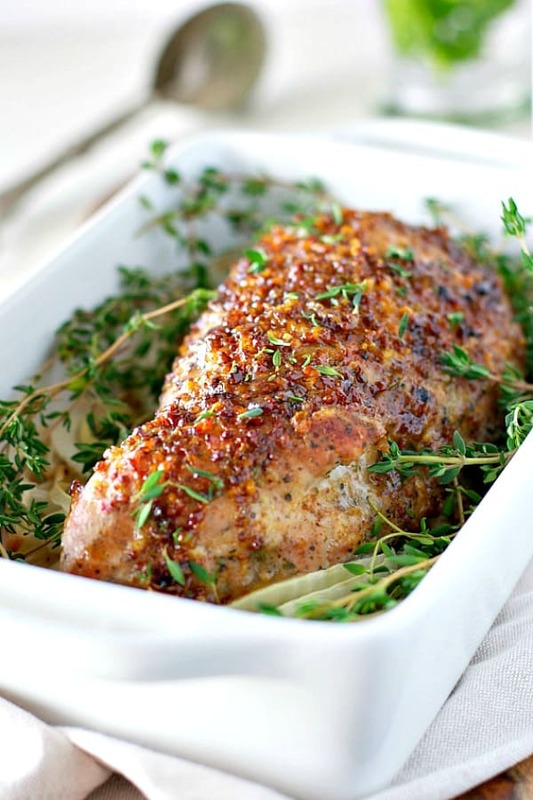 The thyme sprigs in the picture are there as garnish, arranged in the serving dish after the pork is cooked, and therefore would not impact the flavor of the pork itself. I’ve never seen a recipe include instructions for garnishing which is why I’m guessing they weren’t included here either. Is there a sauce that would go with this pork dish please? 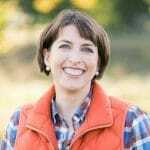 Hi, Nichola! The meat doesn’t really need an extra sauce beyond the honey dijon glaze that you put on top of it; however, if you would like a “dipping sauce” to use after the pork is baked, I would suggest doubling the honey dijon sauce from the recipe and setting aside half of it for serving later. You can thin it with a bit of water whisked in if you want it to be a pourable consistency. Hope that helps! That’s a really big tenderloin, Melissa! They’re often sold in packages of two. Have you opened the package to make sure that you don’t have two separate tenderloins packed in there? If you’re really cooking a 3-lb. tenderloin, a good rule of thumb is to cook the tenderloin at 400 degrees for 10 minutes. Then reduce the heat to 350 degrees and continue roasting for about 20 minutes per pound. The best way to really tell if your meat is properly done, though, is to use a meat thermometer and remove it from the oven when it reaches between 140-150 degrees. Let it rest for about 10 minutes (it will continue cooking as it rests), and then slice and serve. Thanks. Looks like it’s a pork loin so it was one big one. Oh well, I made it anyway. We shall see.. thanks for your help! This was excellent and my kids loved it! I cooked it in the oven, exactly as directed – came out great. Can’t wait to try it on the bbq! Came out pretty good love the sweet and salty flavor it has. Was delicious .